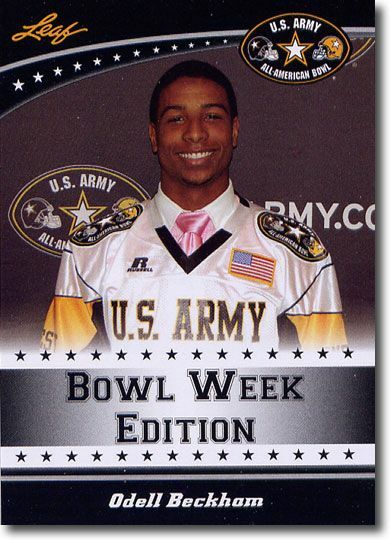 You are bidding on a 10-Count Lot of Odell Beckham 2011 Leaf US Army All-American "Bowl Week Edition" rookie cards. The only way to get these cards was at the game itself, and we were there to scoop up all the cards we could get. These are the first true, certified licensed rookie cards of these players. You will get these rookies from when he was a Senior in High School, and played in the US Army All-American Football Game in 2011. This product was very hard to get, very costly, and the cards are not only rare, but amazingly high in quality. Odell Beckham will not have another licensed football card made for four years after this product is released! No company can legally produce a card of NCAA player...thus he will not have another card until he is drafted into the NFL. This will be his ONLY and BEST rookie card for the next 3 years! Just like Topps does with their Aflac and Under Armour cards, these cards are only available at the game. Imagine what these can be worth if and when he is a 1st-Round Draft Pick in the NFL...or when he hits the cover of Sports Illustrated!! So young. So talented. One of the top recruits in the entire nation! The US Army All-American Bowl Game contains the premier talent in the nation. Imagine what a high school rookie of Tom Brady or Chris Johnson would be worth - the ones for Lebron James and Bryce Harper are worth upwards of a hundred dollars. Licensed and listed in Beckett, much rarer than most brands, this is sure to be one of his most sought-after cards in the hobby. All of our cards are in tip-top condition, ready to grade. Once again, you are bidding on a 10-Count Lot of Odell Beckham 2011 Leaf rookie cards - all the same card shown in the scan. GET THEM NOW WHILE YOU CAN! Also, be sure to check out our other auctions - we have TONS of rookie cards listed - base-cards, variations, autographs, limited edition, etc - and you can find it all listed on eBay right now! Please email with any questions before bidding. Thanks for looking and Good Luck!